Last week I completed the “Foundation Phase” on schedule. 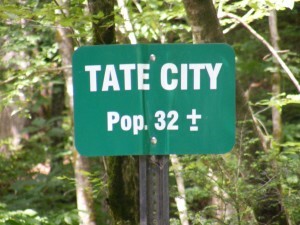 And I spent the weekend backpacking just over the border in the vicinity of Tate City, NC (pop: 32 +/-). We did what amounted to about 10 miles total, including the side excursions. To get to the trail head, we drove up to Clayton, GA and turned left onto Route 76, then after about 8 miles, right onto Persimmon Road. Then after about 4.2 miles turning left into Tallulah River Campgrounds. This road quickly turns to gravel and winds its way through the very scenic Tallulah River Gorge. Shortly after crossing the State line, there is a parking area on the left where you can park and then cross the road to begin the hike at the very nondescript trail head. The trail leads you steeply and quickly up and over Scaly Ridge and you descend to meet the Beech Creek trail. Initially, there are several creek crossings involved which will vary in difficulty depending on water flow. On this weekend, the crossings presented no difficulties whatsoever. Soon we came upon a junction which offered the option to branch off to the right to view Bull Cove Falls. The Trail was marked “BCF” by someone who had gotten a little too intoxicated with the use of spray paint. I didn’t have the map out at this point, so Bull Creek Falls wasn’t in my consciousness and whatever “BCF” was, it certainly wasn’t in the correct direction of our hike. So we missed out on Bull Creek Falls. Our ignorance, as always, carried us blissfully forward. The Beech Creek Trail and the remainder of the hike consists of old logging roads, now somewhat grown over and used as hiking trails. Even though it was once a road, the grade gets pretty steep. In fact, it’s a constant up until you reach the junction that leads to the High Falls. Despite the significant elevation gain, Beech Creek is probably the prettiest gorge I’ve seen on the East Coast. We encountered some bear/boar hunters while traversing through the gorge. I’ve read that bears den in the rocky cliffs of Big Scaly and take advantage of the ample water supply offered by the creek. As we continued on, we came upon the first of several switchbacks which lead us higher up Scaly Mountain. At the first of these switchbacks, there’s a trail that shoots off a couple of hundred feet down to the creek where you can just glimpse some moderate falls around the bend upstream. 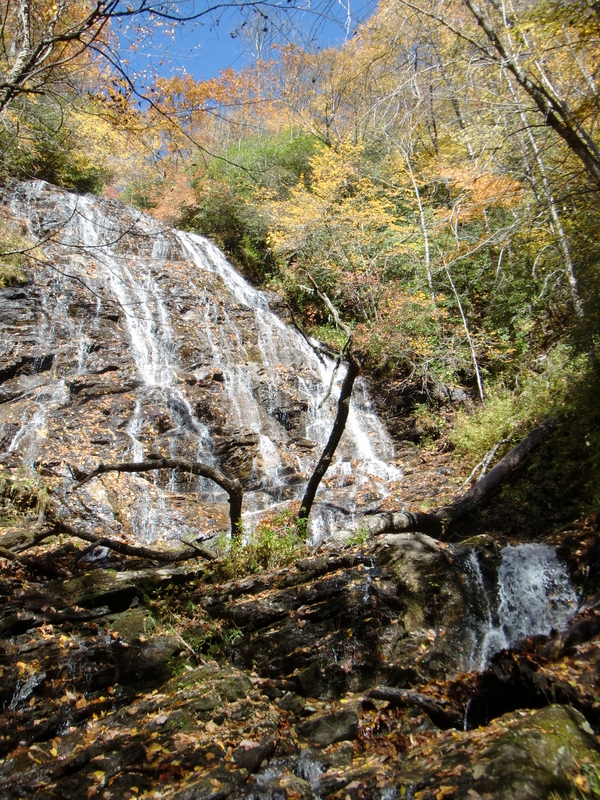 It’s here where you can opt to cross the creek and climb steeply up a faint, unmarked trail to meet the AT at Beech Gap. Unless you’re in some some freakish need to use the Beech Creek Trail as a quick shortcut to access Beech Gap from Tate City, I don’t recommend taking this path. Because in doing so, you would miss out on seeing the beautiful High Falls that lie just around the next switchback. At the next switchback, shortly passing an old, abandoned corundum mine on the left, we came upon the short signed trail that leads off to the High Falls. We dropped our packs at the junction and headed down to see the 200 foot High Falls. Some people eat their lunch with this pretty backdrop. However, I don’t recommend this because after leaving the falls and rejoining the Beech Creek Trail, there’s still some substantially steep up to take on. Doing this with a full stomach could potentially get pretty messy. Once we reached the top of the cliffs, we had gained about 2,000 feet in elevation. Here the trail levels out and offers up several ideal campsites along the creek and its spring. We continued a bit further up to the turn at Case Knife Gap and camped there. After setting up our tents, we crossed the trail to walk up the moderate grade about a mile along the ridge to the summit of Big Scaly Mountain (5,060′). We sat for a while, on a rock outcropping with terrific views to the west and down back to the valley that shelters Tate City and its bustling hubbub (well, we did hear a dog barking). The leaves were peaking before our eyes. After drinking in the views, we came down off Scaly walked back to the Beech Creek Spring and refilled our water supply. Our campsite at Case Knife Gap was perfect in every way. It was level, the ground was soft, there was tons of dead wood for a fire, and it had a grand view of Blue Ridge 500 feet above us with Standing Indian Mountain. The Appalachian Trail runs along that ridge, and we easily heard the conversations of hikers taking in the views from Standing Indian. At our camp, we noticed a faint, unmarked trail that led steeply up the ridge, obviously to meet the AT. We still had a couple of hours of daylight, so we hiked up but decided to turn back just short of topping the ridge. It confirmed to me though that it would be a great hike to do what we had already done, then hike up the ridge at Case Knife Gap and join the AT, taking it to the left to Standing Indian. From Standing Indian, we could then hike down to Deep Gap and take the Deep Gap Trail back down to the road and Tate City. Definitely a hike for another weekend. We had gotten to our campsite early in the afternoon and it was clear to us that we could have easily hiked our loop, or even the loop extended to Standing Indian, as a day hike with small day hike packs. Good to know. On Sunday, we awoke, broke camp, ate some oatmeal, drank some coffee and headed back down, closing the loop along the Chimney Rock Trail. As we came down the trail, we again dropped our packs and took the 1/4 mile jaunt up to Chimney Rock. The side trail is off to the left and prominently marked by two cairns, forming an ostentatious gateway to the modest, otherwise unmarked trail. As good as this hike was, I must say I can’t recommend it. You see, I would rather you don’t go so I can be assured of finding that perfect campsite the next time I venture up there. This entry was posted in Backpacking, P90X2, Round 6 and tagged Appalachian Trail, ARX-2, Backpacking, Balance & Power, Beech Creek Trail, Beech Gap, Big Scaly Mountain, Blue Ridge, Chimney Rock, Deep Gap, High Falls, Loop Hike, P90X2, Rest, Standing Indian, Tate City, Total Body, Yoga. Bookmark the permalink. Dear Albert, excuse me if I vent on your blog but … 4 days to go through Insanity and … knee injury! What the F#@§*! Alex, As you know, the same happened to me in the final weeks of my Hybrid in the Spring. It took many months to recover. Please be sure to get guidance to rehab yourself back to health.